The court faulted Mr. Etete’s claim that he was not an owner of Malabu. 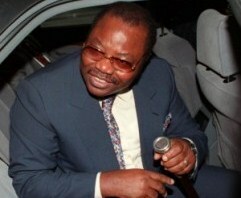 In continuation of the intrigue surrounding fraudulent transfer of $1.1 billion to Malabu Oil and Gas, a British High Court on Wednesday ruled that convicted felon and former Petroleum Minister, Dan Etete, should pay at least N16.5 billion ($110.5 million) to Emeka Obi, the owner of Energy Venture Partners for helping him facilitate the sale of the controversial oil block OPL-245. Mr. Obi had brought charges against Mr. Etete claiming he was owed $200 million for helping to secure the deal that lead to the sale of the oil block to global energy giants, Shell and ENi, on behalf of Malabu. The judge also confirmed what PREMIUM TIMES had reported that Mr. Etete seized the opportunity provided by the death of late dictator Sani Abacha in June 1998 to take full control of the shady company and cut out the dictator’s interest using a collection of aliases including the that of his yacht, “Amaran” to appropriate the company to himself. The statement by the court further confirms that the Jonathan administration represented by Minister of Justice, Mohammed Adoke facilitated the fleecing of $1.1 billion of public fund by acting as a conduit for the transfer of the money to Mr. Etete, a convicted money launderer. UK based energy campaign organisation, Global Witness, while expressing its disappointment in the ruling, says by not considering the legality of the deal itself, Nigerians were surcharged with over a billion dollars of public fund. “From Global Witness’s point of view, the decision before Court effectively came down to whether or not to give cash to a crook who had stolen the block worth over a billion dollars from the Nigerian people, or to the middleman who claims he brokered the deal to sell it on.” said Simon Taylor, Director at Global Witness. Meanwhile the House of representative has summoned Mr. Adoke to appear before it to explain a letter is allegedly wrote to Transparency International he has been absorbed of all wrong doing by the legislator in the murky deal. A report by the house has accused Mr. Adoke of being the main facilitator of the fraud. He denied this saying the government only acted as an intermediary and knows about the fraudulent nature of the deal. The House will soon commence deliberation on the content of the report.